Missing Pets Perth and Kinross was set up 5 years ago to help reunite missing pets with their families and offer advice and support when needed. After having our own family dog Charlie disappear one afternoon I know first hand how upsetting, stressful and heartbreaking it can be to have a much loved member of the family go missing. Thankfully we were very lucky and we were reunited with Charlie later on the same day but it was a horrible experience. It was from then that I decided to set up Missing Pets so I could help other missing pet owners. In the 5 years since Missing Pets Perth and Kinross has been set up it’s not only dogs and cats that have been reunited. Horses, rabbits, chickens, sheep, birds of prey and even a lizard have had happy reunions with their families. There have now been over 1500 pets reunited. Some after a few hours of being on the page, a few others have been reunited after 3 years of being missing. We have even helped reunite missing pets that have been found 100’s of miles away. I help mostly by posting appeals on the Facebook page and offer as much advice as possible to pet owners of steps to take to help reunite them with their missing pet ASAP but I can’t take all the credit for reuniting missing pets. 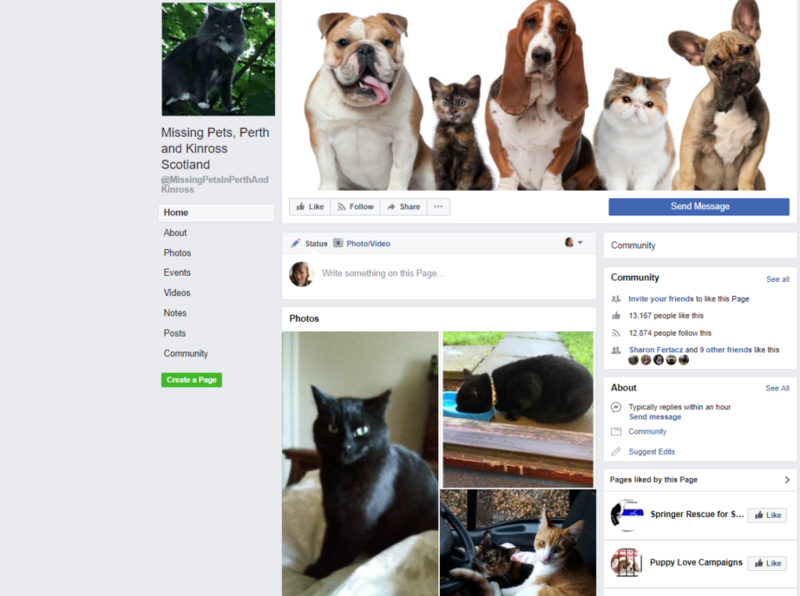 There are over 13,000 loyal and dedicated followers of Missing Pets Perth and Kinross who help share appeals, volunteer their time to go on searches and even offer words of comfort to families. Missing pets appeals will continue to be posted on the Facebook page but below is some information and steps to take if your pet goes missing to hopefully help you be reunited with them as quickly as possible. If you dog goes missing then please contact Perth and Kinross Dog warden (01738 476476), PADS (01764 684491) and the Police (101) to report as missing. There is also the Facebook page LostDogs-Scotland.org.uk who can help with appeals and give further support if needed. Please also register your missing dog with the website DogLostUK. They are the UK’s largest lost and found dog database and have large a volunteer base who can also help further with support and offer help with missing posters. It’s very important to make sure all your contact information is up to date on your dogs microchip. If you find a ‘straying’ dog then you must report them as found to the Dog Warden and if they are closed then report as found to the police. It’s also a good idea to report as found to PADS. This is really important as you could delay a missing dog being reunited with their family and by law you must report finding a stray dog to the appropriate authorities. Cats Protection Perth to report as missing. The Facebook page Missing Cats In Scotland can also post an appeal. Contact all the vets within 30 minutes of where you live and the SSPCA in case your missing cat ends up in their care. If your cat is microchipped please make sure all contact information is up to date on their chip. If you find a cat that you are concerned is lost then again please contact Cats Protection Perth so they can check their lost/found register and do the same with the local vets and the SSPCA. If possible please take them to a local vet who will scan for a microchip. With all other missing pets you are best contacting all local vets, SSPCA and sometimes even the police who may have information. If your pet is microchipped again it’s very important to make sure all your contact information is up to date on the chip. Putting up missing posters in your neighbourhood can also help with sightings and information to help locate your pet. When contacting us regarding your missing pet please send all the following information. • How did they go missing? • Are they of a certain breed? • Were they wearing a collar when they went missing, if so what colour? • Do they have any distinct features? • And of course please send a picture of your missing pet. If you wish certain information to remain private between us then please state that in your message and it won’t be made public. 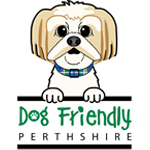 Missing Pets Perth and Kinross is run on a complete voluntary basis and just by me. Some days it can be extremely busy so please be patient if it takes me a while to reply but I will always do my best to respond as quickly and possible.